An iconic piece of architecture in the city of Dunedin, its struggles and success throughout the years are held up by its charm and the love it has from the community. A luxurious hotel at its time the Fenway Hotel began construction in 1924. Its proposal lied on the influx of “snowbird” visitors that would fly down to Florida during the winter season and the demand for more hotels to accommodate them. 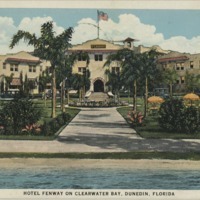 Built on an area known as Fenway on the Bay its location was close to local tourist attractions such as Downtown Dunedin. The style of the hotel was described to be build based on a Mediterranean Revival style with three stories and overlooking St. Joseph and Clearwater bay so every room could have a view. The hotel project urged the support of Dunedin residents to fund its creation and ask locals to “do your part, dig down in your jeans and dish out the necessary coin”. Given the extent of financial contributions the community had given already its continuing support in funding was justified. However, not enough stock was bought by the public to complete construction of the Fenway so real estate entrepreneur George H. Bowles purchased the rest of the stock for $250,000. George H. Bowles having an interest in radio broadcasting created the first commercial radio station in Pinellas County at the Fenway before its completion. Bowles purchased used equipment from an Atlanta radio station, set himself as the Director of Broadcasting, and located the studio on the third floor. On December 10, 1925, Bowles held a dedication program that ran for over six hours. 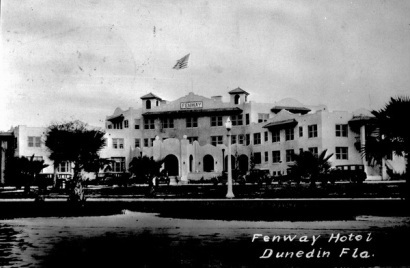 Given the limitation of radio stations at the time, the Fenway received an outpour of telegrams that stumbled upon the program boosting the attention of the city of Dunedin and the Hotel. The hotel was completed in 1927 but it was quickly sold to the Title and Trust Company of Florida during a mortgage foreclosure sale. The hotel went through two other owners in a span of two years until James McGill bought the hotel in 1929 for $58,000 and turned it into a local success. Opening up the hotel for seasonal use McGill transformed the Fenway as one of the finest hotels around. By 1938 the hotel had a reputation to hold notable guests including wealthy families, diplomats, artists, and more. 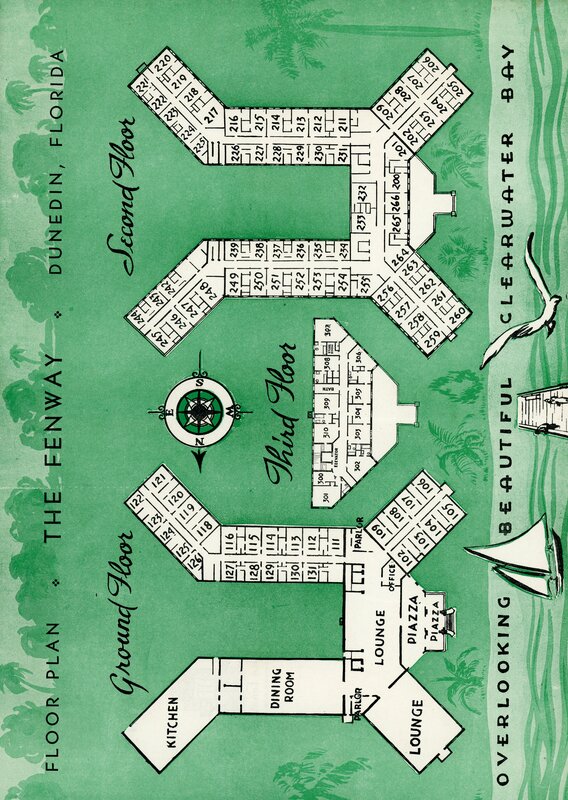 Its success turned Fenway guests into Dunedin homeowners and was stable enough to not be affected by World War II. In August 1945 the Fenway was sold to C.T. Scanlan former manager on son in law of McGill. Scanlan only owned the hotel for 11 years selling it after his wife passed away and marrying Doris Price. The hotel’s new owner Marius Pauchey made several changes to the hotel such as opening it year round, opening the pool to the public and creating a private club that proved unsuccessful. By 1961 the hotel was on sale and it was purchased by Trinity college that had outgrown their previous campus. The college remained at the Fenway for over 20 years before moving to Pasco County in 1988. At this point, the hotel was mortgage free but no one would buy it. By 1994 the Fenway was purchased by a German college the Schiller University. The campus was very successful even building additions to the Fenway. However, the attack on 9/11 affected the number of international students willing to study at the campus so the hotel was sold again. Over a span of 15 the hotel has seen a number of owners, foreclosures, and periods of abandonment. In 2015 the hotel was purchased by the Marriot to be a part of their international Autograph Collection as a one of a kind boutique hotel. Opened in 2017 the historic hotel is beloved by the community and the public who take pride in their “Grand Lady of Dunedin”. Gabriela Torres, “The Fenway Hotel,” Tampa Historical, accessed April 20, 2019, http://tampahistorical.org/items/show/71.